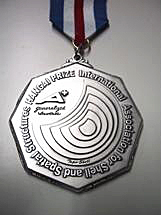 In memory of Professor Yasuhiko Hangai (Japan, 1942-1998), a very active member of the IASS and its Executive Council, and in accordance with his career-long encouragement for young people, the Hangai Prize recognizes talented young researchers, designers, and engineers working in the field of shell and spatial structures. This recognition is achieved by selecting outstanding submissions to the Annual IASS Symposium in the form of research papers, résumés of design projects, or innovative ideas. To address inquiries about the Hangai Prize not answered by the following sections of this page, e-mail the prize committee. 17th Hangai Prize, 2019: The next round of the Hangai Prize competition is for the IASS 2019 Symposium to be held in Barcelona, Spain, 7-10 October 2019. General application instructions, as they become available, are detailed below, including the specific deadlines. Please note that the deadline for the full paper submission to the Hangai Prize Committee is earlier than the deadline for submission of full papers to the IASS 2019 Symposium. To be considered, papers must not only be submitted to the annual symposium but also be explicitly entered into the Hangai Prize Contest. Papers that have previously been submitted for publication in the Journal of the IASS are not eligible for entry in the Hangai Prize competition. if selected as a winner, attend the Symposium to present the paper in a plenary session and to receive the prize. (4) publication of the contributions in both the Symposium Proceedings and the Journal of the IASS. As an incentive for entering the competition, all applicants - whether winners or not - who attend and present their papers at the Annual Symposium receive a free one-year IASS Awardee membership for the full calendar year following the symposium. Submission of the abstract to the symposium website: Using the session code 84 used to designate the contribution as an intended entry into the Hangai Prize competition, upload a one-page abstract to the symposium upload site no later than the deadline of 15 February 2019 (extended from original deadline of 31 January) Note that acceptance of the abstract by the symposium scientific committee is a precondition for the next step. Uploading of the full paper to the Hangai site: After the abstract has been accepted, upload the full paper and the completed Hangai Prize entry form to the Hangai Prize online application and uploading website* no later than 31 March 2019 (two months earlier than the symposium deadline) for review by the Hangai Prize committee. Uploading of the full paper to the IASS 2019 site: In addition, the applicant must upload the full paper to the symposium uploading site no later than 31 May 2019 for review by the symposium scientific committee. *The URL and a link to the Hangai Prize uploading site is https://easychair.org/conferences/?conf=hangai2019.